Release 2.3.0 (ask for support). Unzip and launch run.sh (Linux/macOS) or run.bat (Windows). Requires Java 9: to install Java SE 9, get the Windows/macOS JRE installer or run apt-get install openjdk-9-jre on Linux. The Sirio library is now available! The library implements the symbolic calculus and analysis methods of ORIS. STPN models can be exported from the GUI editor as "Java code" and analyzed in Sirio to conduct parametric studies. Petri nets can be edited graphically, associating transitions with earliest and latest time to fire (time Petri nets), or with a deterministic or expolynomial probability density function with finite or infinite support (stochastic time Petri nets). The editor includes features such as undo, cut-and-paste, zoom, magnetic grid, alignment and even spacing of elements, SVG export, sticky notes. The state class graph of time Petri nets can be computed and visualized graphically. For stochastic time Petri nets, the state class graph can highlight regeneration points and exclude firings with null probability. Transient state probabilities of stochastic time Petri nets can be computed through the forward enumeration of stochastic state classes (distributions of time-to-fires after each firing) within a time-bound. Regenerative analysis combines the enumeration of stochastic state classes up to regeneration points with integral equation systems, in order to exploit the repetitive structure of the underlying stochastic process. 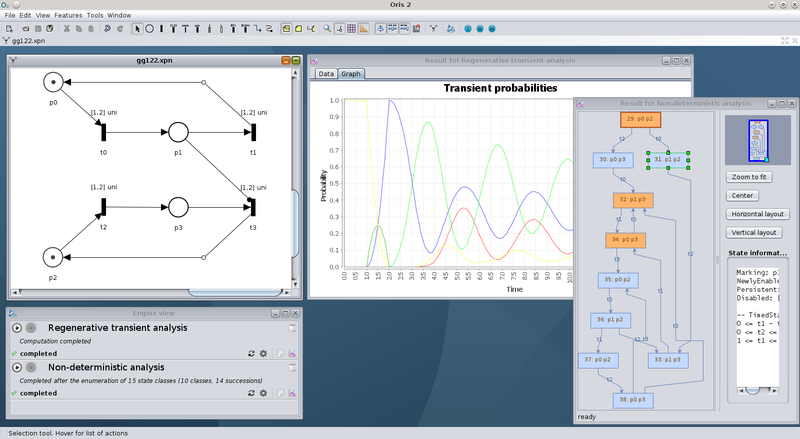 A previous release of ORIS, with support for the analysis of non-deterministic preemptive models, can be found at stlab.dinfo.unifi.it/oris1.0.